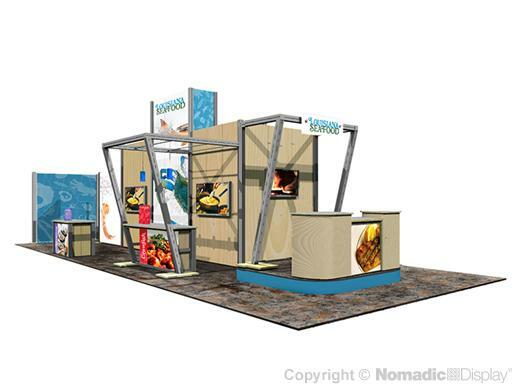 Nomadic has a whole new generation of breathtaking custom modular trade show displays that are helping you drive brand visbility in key markets. Our hybrid display solution blends individual strengths of different product lines – aluminum extrusion, Platinum laminated panel and tension fabric structures –into a contemporary selling environment that is lighter in weight and more compact than traditional exhibits. Nomadic hybrid custom modulars support the latest state-of-the-art functional accessories including: luminous back lighting, integrated and freestanding display counters for showcasing products, high impact graphics, layered signage and an interactive A/V workstation.